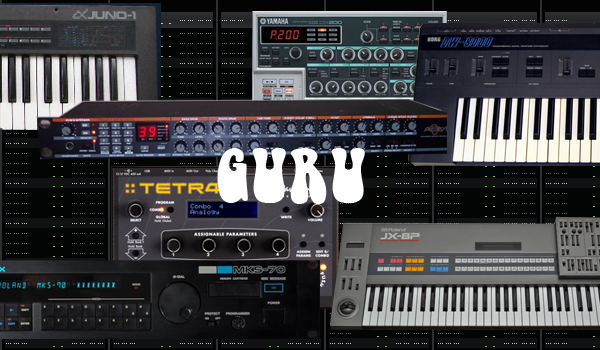 Guru currently supports* the following hardware: Roland JX-8P and MKS-70, Roland Juno 1, Juno 2 and MKS-50, Roland Juno 106, Novation A-station, Electrix MOFX, Korg Poly-800 with Hawk-800 mod, Meeblip SE and Micro, Yamaha DX200, Yamaha DX7, Yamaha TX81Z, Novation Drumstation, Korg DW8000, DSI Tetra. The parameters of a synth are mapped using a "synth definition", which is a file that tells Guru which parameters are available and how the synth communicates. You can, with not too much effort, create these yourself to support any hardware you wish (given it supports editing via MIDI). A users manual and maybe a video will come soon..